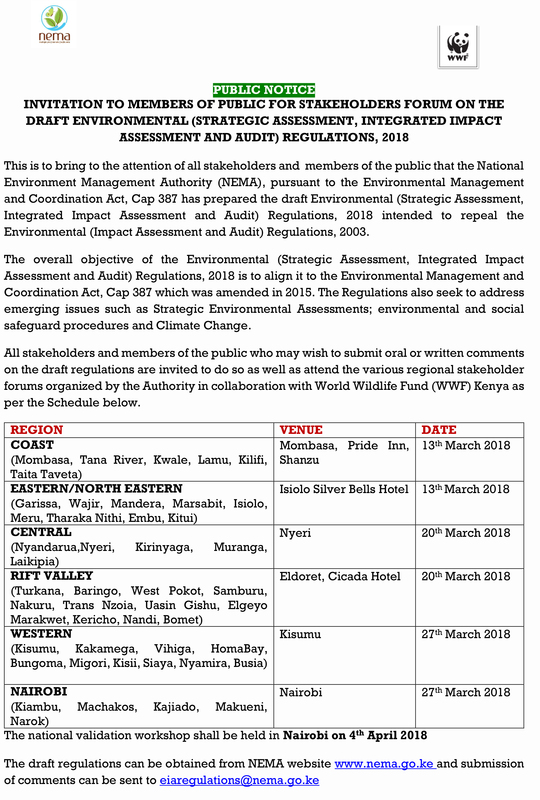 This is to bring to the attention of all stakeholders and general members of the public that the National Environment Management Authority, pursuant to the Environmental Management and Coordination Act, Cap 387 has prepared the draft Environmental (Strategic Assessment, Integrated Impact Assessment and Audit) Regulations, 2017 intended to repeal the Environmental (Impact Assessment and Audit) Regulations, 2003. The overall objective of the Environmental (Strategic Assessment, Integrated Impact Assessment and Audit) Regulations, 2017 is to align it to the Environmental Management and Coordination Act, Cap 387 which was amended in 2015. The Regulations also seek to address emerging issues such as Strategic Environmental Assessments; environmental and social safeguard procedures and Climate Change.